I’ve signed up for the webinar and really looking forward to it. However, I would appreciate the recording as I won’t be able to take part live. How would I access the recording? You’ll receive an email with a link to the recording after the webinar. 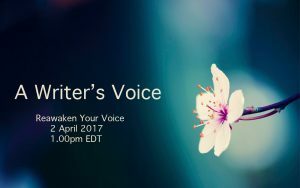 What you hope to get from the webinar–authenticity–is at the heart of putting one’s voice on the page. The short answer is that your voice is nothing less than the content of your heart and mind and soul. I wrote a post for SavvyAuthors as part of my teaching there, Your Voice Is Never Wrong. It’s also a way of understanding authenticity. Your voice can never be wrong. The story’s (narrative) voice may not be right for the story, but your voice will never be wrong. I will definitely read the Your Voice is Never Wrong, post. What a great help. I look forward to the webinar.